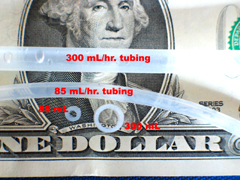 Soft, peroxide-cured silicone tubing for maximum tubing life. The 85 mL/hr. 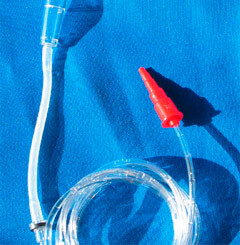 tubing is used in our 2-channel sets, and the 300 mL/hr. 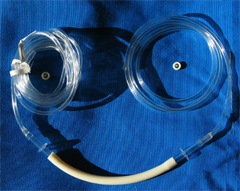 tubing is what's used in standard drip sets that come with unmodified medical pumps. 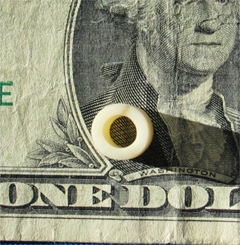 One channel requires a length about 4 3/4 inches long. All prices are for 2 foot lengths, and include shipping to the U.S. Please email us for overseas shipping prices. 850 mL/hr. Capacity tubing for our "High Volume Sets"
Price is for a 1-foot length, adequate for two tubing changes, and includes shipping to the U.S. Please email us for overseas shipping prices. These are the ones with the capsule and the magnet, made for dosing pumps including Kangaroo (which needs a special drip set).Price includes shipping to U.S. Please email us for overseas shipping prices. 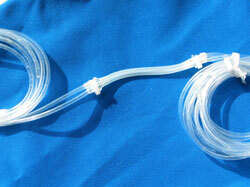 These 1-channel sets allow you to dose up to 850 mL/hr. or a little over 5 gallons per day. These are used primarily for water make-up. Price includes shipping to U.S. Please email us for overseas shipping prices. 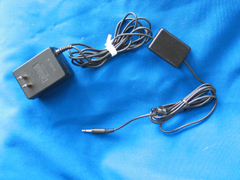 This interface plugs into the back of our pumps to provide on/off control using either a timer, pH controller or a/c controlled float switch. The interface's a/c plug plugs into any controlled power source and then the interface plugs into the jack at the back of our pumps. When the a/c plug of the interface is energized, the pump will run at the set rate. When the a/c plug of the interface is NOT energized, the pump will keep its' display but standby only (not pump). 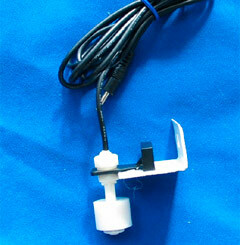 The float switch plugs into the control jack at the back of our pumps to provide liquid-level control.